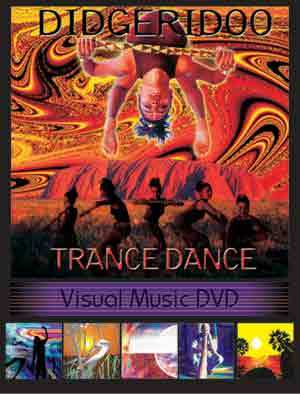 A fast-paced visual music-on-dvd montage of multi-coloured dancers, creatures and stunning landscapes from the magical realm of Australia. Pumping rhythms of the wild. Droning, eternal voices of an ancient-future. Exotic nature sounds and rapid-fire percussion create an inter-dimensional journey into mindless spirit. Here you can listen to the music and download individual audio tracks or the full album - if you wish to buy only the music. Click Download (above) to buy the album or any track(s) in 320k MP3, FLAC, or just about any other format you could possibly desire. Nothing less than spectacular can be said for this pumpin visual music DVD from our friends at Music Mosiac. Kaleidoscopic images of the gorgeous Australian landscape and wildlife teamed with trance-E visuals of people at play (dancing, loving and trancing) make this DVD more than just a music video release. The mesmerizing tunes lend to a very handy music utility not only for dance but focusing disciplines, delta meditation practise and of course recreational or social gatherings. As a practising Remote Viewer, I find Didgeridoo Trance Dance a nice preparation tool engaging the theta and delta rhythms and the use of binaural beats to reach the right mind set prior to RV practise. Didgeridoo Trance Dance brings forth a superb representation of Australian culture and the mysterious powers of our indigenous peoples. Grab this CD ASAP!